For some waterfowl, the Mississippi Alluvial Valley is not a final destination, but a stopover on the way to a milder winter resort-the Gulf Coast. Stretching from the Mississippi-Louisiana state line, west and south to the mouth of the Rio Grande River, the marshes and bays of the Gulf of Mexico were once among the most productive wetland systems in North America. Today, the region's ability to support waterfowl has been severely compromised by natural and human-induced changes that have caused dramatic loss of wetlands and their associated functions and values. The North American Waterfowl Management Plan Gulf Coast Venture calls for Gulf wetlands to winter up to 13.7 million ducks and 1.5 million geese, making it among DU's highest priorities. Wintering habitat for large continental populations of several species: 95 percent of gadwall, 90 percent of mottled duck, 80 percent of green-winged teal, 80 percent of redheads, 60 percent of lesser scaup and 25 percent of pintails. Provides migration habitat for most of the blue-winged teal that winter in Central and South America and wintering habitat for mid-continent lesser snow and white-fronted geese. 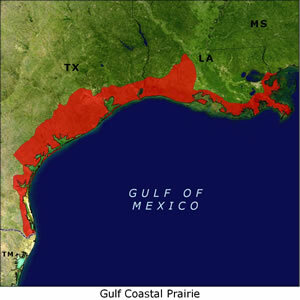 Gulf coastal marshes have been adversely affected by the construction of levees on the Mississippi River, the Gulf Intracoastal Waterway and numerous navigation canals. In the past 50 years, marsh has been lost at a peak rate of about 40 square miles annually. More than 1.2 million acres of Louisiana's coastal marsh have been converted to open water since 1932. Since 2005, four major hurricanes and the Deepwater Horizon oil spill have accelerated marsh loss and degradation along the Gulf Coast. Coastal marsh is further threatened by global climate change and related sea level rise. Net losses of an additional 402,000 acres of coastal wetlands are expected to occur in the next 50 years in Louisiana alone. Coastal interior prairie wetlands are being lost to developments and urban expansion. Water availability limitations, particularly in Texas are threatening rice agriculture and other managed wetlands along the coast. Recent declines in rice acreage in the region contribute to the loss of feeding and resting habitat. DU is continuing to increase coastal conservation efforts along the Gulf Coast. For a complete breakdown of DU's Gulf Coast Conservation Initiative, visit the Gulf Coast Initiative home. Restoration and enhancement of key public land habitats with state and federal partners. Restoration and protection of high-quality waterfowl habitat on private lands, including seasonally flooded agricultural land (mainly rice) and natural and managed freshwater and intermediate marshes. Advocacy for restoration of natural process necessary to sustain the coastal ecosystem. Advocacy for water allocations that support waterfowl habitat, including rice irrigation and wetland management.